It was only one day at camp, but Kendall Wright was running circles around the Bears’ defensive backs. Admittedly, this is not a great group of corners and safeties, but still one could see the talent that made Wright the 20th pick in the 2012 draft. And it shouldn’t be a surprise if the Bears use him a lot more than Tennessee did in recent seasons. Part of the reason why Wright is with the Bears is because of his history with Dowell Loggains. Loggains was promoted to offensive coordinator in Tennessee late in the 2012 season. In his first game, Wright had 10 targets, then 9 the following week. The next season, the Titans made an active attempt to get Wright the ball and he racked up 140 targets, catching 94 for 1,079 yards. But there’s reason to believe Loggains will get him back on the right track. I have Tweeted incessantly for the last three years about the disaster that is the Indianapolis Colts. They were given football’s greatest gift, a franchise quarterback directly on the heels of a franchise quarterback. And what have they done to support him? Nothing. Under the regime of Jim Irsay (who is as much to blame as anyone), Ryan Grigson (who might be the league’s worst GM) and Chuck Pagano, the Colts have failed to build Andrew Luck either an offensive line or a defense. They’ve signed fading veterans in free agency, drafted speedsters they don’t need and let supremely talented players – *cough* Jerell Freeman *cough* – walk out the door for no reason. This last item came to head in London where Freeman’s replacement, Sio Moore, was so bad he was thrown out of the team plane over the Atlantic Ocean. Hoyer is well-aware that his performances over the last two weeks are not just those a back-up quarterback filling in while the starter’s thumb is in a sling. Hoyer doesn’t have a lot more time left in this league and if he continues to deliver 300-yard, no interception efforts, and more importantly win, it will make the decision to pull him off the field a very difficult one for John Fox. The Colts defense is one of the worst in the league and Hoyer is going to be tempted to throw the ball down the field with more frequency than he did last Sunday. But not succumbing to those desires is exactly what’s enabled him to play efficient football. Not having Kevin White running go routes down the field may make this a bit easier. The argument I made all offseason as to why the Bears would be more competitive in 2016, especially within the division, was because they were already competitive within the division LAST season. Yes, they went 1-5. But both Detroit games and the home Vikings game were complete coin flips. The only time a division opponent clearly outclassed them was in Minnesota, a game the Vikings needed and Bears didn’t. Brian Hoyer is going to be the story this week. Nobody thinks less of Hoyer than I do but that kind of efficiency will excite John Fox in the tape study sessions. He dinks and dunks, sure, but the offense looked like a real offense for the first time this season. So why so few points? Well, Hoyer is why. Alshon Jeffery will be reduced to basically the third option as long as Hoyer is playing quarterback. Hoyer is a timing/crossing route quarterback. Jeffery is a downfield home run hitter. There were a few moments yesterday where Jeffery was isolated in man coverage and Cutler would have unquestionably tossed a jump ball for him. Hoyer (a) doesn’t think that way and (b) can’t physically do it. 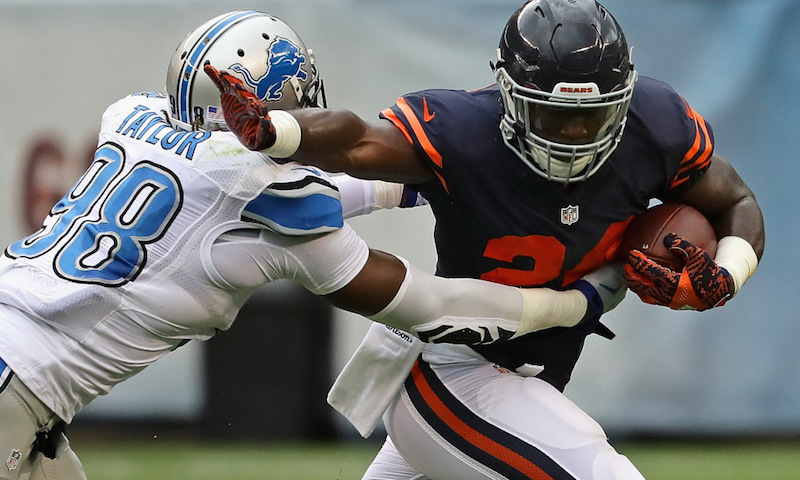 And so begins the Jordan Howard era? 23 for 111. 4.8 average. He’s big. He’s quick. He’s tough to bring down. And against Detroit he showed his versatility in the passing attack. Jeremy Langford’s role changed yesterday. The offensive line is improving every single week. If the Bears can ever get — and stay — healthy at the wide receiver position, their offense should really take off. Their top four receivers missed a combined 36 games, with the only one playing over half their snaps being Marquess Wilson. Youngers players stepped up and made plays but the position, expected to be a strength, ended up being a weakness. If you took the numbers Alshon Jeffery put up in 8 1/2 games this season and calculated them out to a 16-game total, you see a star. The numbers are roughly 102 catches, 1,520 yards and eight touchdowns. Looks great, but you can’t give him credit for 16 games when he doesn’t play 16 games. Injuries are his biggest problem and there’s no reason to think they will go away. So how do the Bears assign him a value? By not signing Jeffery before the season, the Bears made it clear they didn’t view him as an elite receiver. As good as he was at times, it’s hard to say he did anything to increase his value. The Bears can’t let Jeffery hit the open market, however, because someone else will offer him top-tier receiver money and Chicago doesn’t have a replacement. Whether it be with the Franchise Tag or a long-term contract, the Bears need to bring Jeffery back. We don’t know what Kevin White is. We think he’s a stud and when we hear Ryan Pace say he can’t wait to “unleash” him, it makes us believe that even more. Still, he’s going to be raw and nobody has a clue what kind of long-term effects the leg injury might have on him. While I have issues about Rolle’s performance last season it is impossible to argue the Bears don’t need the man described above in their locker room. Antrel Rolle is not a great player anymore…and I’m not sure he ever was a great player. He was an alarming liability in coverage last year for the Giants. But the second he signs with the Bears he’ll improve the safety position and he is also one of the most accountable leaders in the league. (He also does a weekly radio show in NYC and delivers brutally honest assessments of his defense’s play.) 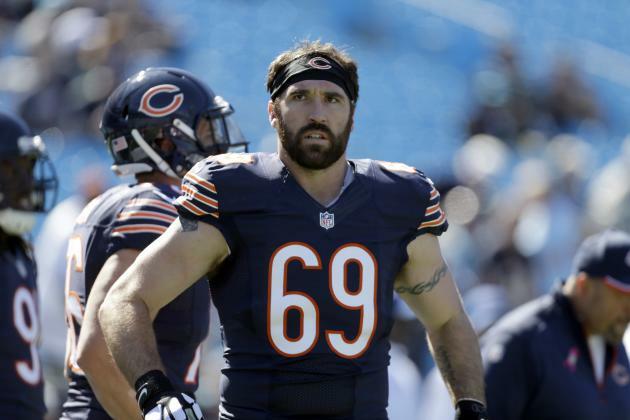 The Bears shouldn’t be relying on his services two or three years down the road but he is someone who can make a few plays short-term. Eddie Royal excites me. Royal is a perfect complementary receiver for Alshon Jeffery and his history with Jay Cutler will lead to an immediate comfort zone. Royal has been one of my favorites for years. My first thought when Jay Glazer reported the Seahawks had acquired Jimmy Graham from the Saints was if they had him a few months ago they don’t throw that moronic slant route and lose the Super Bowl. I have issues with Russell Wilson’s accuracy from the pocket but guess what, it doesn’t matter now. If he puts the ball within three yards of Graham’s head it’ll be caught. Can’t imagine a scenario wherein the Seahawks don’t open the season as favorites to represent the NFC in the Super Bowl.